The MHI Equipment Donation Program helps to get schools like Western Guilford the equipment they need to build learning labs. 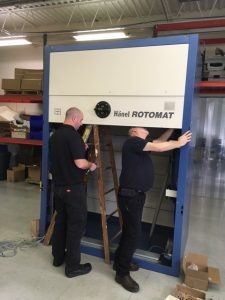 The Rotomat equipment donated by Hanel Storage Systems will provide hands on training to about 60 students in the Western Logistics Program. Equipment assembled by Art Close, Logistics Instructor and students at Western Guilford High School. The Western Logistics Program is the only one of it’s kind in North Carolina. This program helps students get hands-on experience with some of the technology and procedures of a modern warehouse. It also teaches how businesses manage their logistics operations. For more information of the Western Logistics Program view article Western Guilford teaches students the technology of moving products to market. Exhibiting at ProMat? Sign up to donate your equipment. MHI Career & Technical Education’s Equipment Donation Program is designed to assist industry education programs in obtaining material handling equipment for their working labs and training facilities. Contact Angela Jenkins by March 15 to donate your exhibit equipment from ProMat.